From 1st to 5th February 2016, SEW partners all over Europe will present the projects sponsored by Startup Europe and all other relevant initiatives being developed in regional ecosystems. Entrepreneurs will have the chance to meet Startup Europe project leaders as well as some of the most relevant people supporting entrepreneurs in your region. During one week, the Startup Europe Week will unite all european regions to help entrepreneurs make a difference and turn Europe in a better place to start and grow a business. 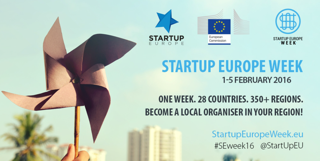 Startup Europe’s next big activity is Startup Europe Week, a bottom up movement that aims to set up a meetup in every single region of Europe to inform startups about the available support and resources both at local and EU level. We invite you to explore details & register a #SEweek16 meeting in your city or region. Our goal with Startup Europe Week is to bring together entrepreneurs and regions, closing a gap that is very unique in Europe – the importance of local / regional support in new business creation. To make this a reality we need local champions able to mobilise the most relevant actors of their local ecosystem.